I was one of the closest witnesses of the heaviest flood for the last 60 years in Petra, Jordan. It was a smashing event, which left breathless even the native locals who are generally used to the floods in the area and experience two or three per year in the Valley of Moses (Wadi Musa). It was November 9th , 2018 . It began as a quiet usual day in Petra, full of tourists, as November is peak season here, normally over crowded by foreigners. I did not have any time to get scared. Everything was happening so speedily and appeared suddenly literally from nowhere. Nothing that day indicated for a dramatic development. The morning was even sunny, with thousands of visitors, impatient to see and enjoy the second of the new seven world wonders. About noon it starting drizzling, not really raining, and no one paid much attention to it, because Petra is popular as one of the driest spots on the planet. I remember, at that moment, I was just staring from the hotel window at the crowd moving to the ancient park of Petra and was wondering that no one was carrying an umbrella. Probably because all the tourists believed (like I did) it will get dry very quickly and some raindrops would not frighten the adventure seeker. Then I heard the clamor. It was obvious that something extra ordinary is happening outside, a lot of people were over excited and involved in something quite loud. Then I got the feeling that somehow the building is vibrating slightly but I was unsure if I am not hallucinating. Ran out as a bullet to check on what I am missing. And then I saw it. A tall stormy wave of muddy water was filling up the canal next to my hotel. I simply crossed the street and reached almost the edge of nearby canal to see it closer. My first thought was completely insane. I felt like I should immediately film it and the very first reaction was to take my mobile out and shoot the view. If someone tells you that we, the human beings, have a well-designed self-defense instinct, do not trust it. The last thing I was considering at that moment was to hide or to run away. On the contrary, I was absolutely attracted, was unable to take my eyes off of the waters sweeping away all on their way, felt amazed, humbled and at the same time completely hypnotized. The stony construction under my feet was vibrating. I turned to the bridge nearby and saw a car passing through. Right then a very tall wave hit the top of the bridge, almost passing over. My immediate thought was: “Wow…the view from this car on the bridge to the flooding canal should be really spectacular”. I know it’s awkward, but I was regretting for not being in that car, because of the adrenaline of having the prime seat spot at this memorable spectacle. It was full of people – waving, jumping, pointing, petrifying, praying, gesturing, shouting, even laughing and hugging. The street between the hotel and the canal was already covered by muddy large puddles, but no one seemed to be concerned that all this water can go over and flood the town. On the contrary, the crowd was running to get closer and to see the horrifying scene. Then the fire alarm started alerting over the town of Wadi Musa for the threat of flood. Lots of ambulances, firefighting trucks and police were on their way to the ancient park of Petra. I think it was the exact moment when I realized that all these thousands of tons of water were going directly to the park. It was 1:00 pm and the park was full of visitors. The first thrills of fear started blooming, because it was the moment when all of us figured out that the real danger is not around the hotels in Wadi Musa, but for the people caught inside Petra. An ambulance dropped a Spanish couple off, right in front of my hotel, which is the nearest to the entrance of the Visitor Center of Petra. The couple was not accommodated there but they have been terrified from the situation and deeply concerned about their friends, who were still inside Petra. The man was about to collapse and the hotel employees helped him to have a seat inside and provided him with mineral water. Then a lot of bottles of water were delivered to the Reception in expectation of the guests’ arrival back from Petra. And then they gradually started coming back, most of them completely soaked, and covered by mud, shocked and exhausted. They were gratefully accepting the water but somehow were not in a hurry to go to their rooms. I saw people with completely muddy clothes and shoes. Obviously, some of them already checked out from the hotel but were hoping to find a shelter back in there. I should admit the organization was great. The people with no rooms were offered to take a shower in the wellness area, because the hotel was fully booked. Bathrobes, towels and bath amenities were provided complimentary. Some of the “leaking” guests got express laundry service, free of charge. Arabic coffee and dates were served complimentary in the Reception area. Thank God the humanity is not over, I felt proud and inspired to take part in all that organization, regardless of the visitors’ nationality, hotel reservations and level of involvement. 40 minutes later the flooding water was already calming down and the level in the canal was much lower. The people still kept coming back from Petra without panic, just telling us stories where and how they have been caught or trapped by the flood. Most of them managed to climb over the rocks and to watch the flow from above. Others were just laughing and celebrating the relief of being safe and sound after this challenge. I saw lots of hotel guests thanking their local tour guides who saved them by efficiently organizing and arranging their trail to a high safe spot. Lots of rumors and gossips started running around for missing people. The first one broadly spread was the story about a Japanese group of 50 people trapped into the flood in Petra. Thank God it was false. Then another story for lost while running from the flood people was going from mouth to mouth, but eventually everyone was found and transferred safely to their hotel. 3500 tourists have been at this moment inside Petra and all of them were rescued. I was there, three days ago and it is one of the most unforgettable moments I have ever experienced, without doubt a lifetime memory. In the very next day the ancient park of Petra was closed, but as we have been informed to be cleaned and maintained for the visitors. No major issues, no damages, nothing blown away. Petra survived again, as used to do for the last 2000 years. 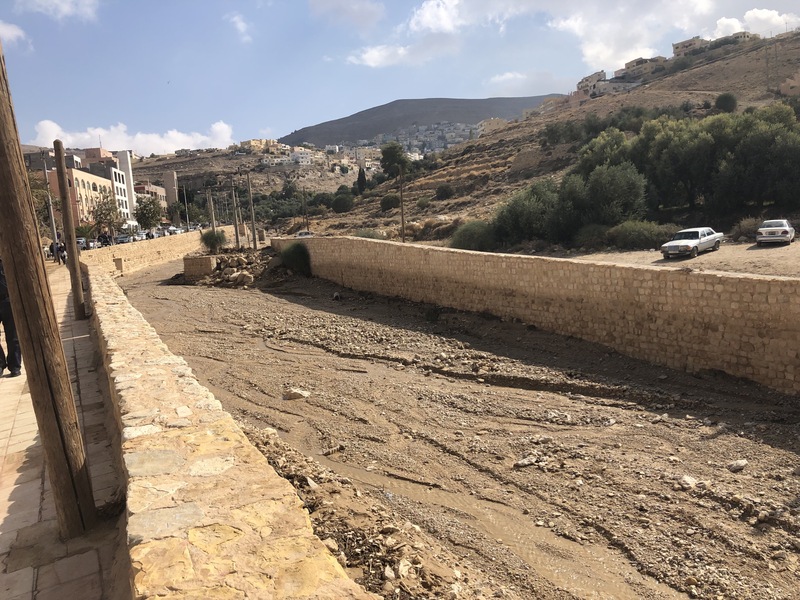 The streets of Wadi Musa were immediately washed from the mud and about 16 hours after the flood it looked like nothing unusual ever happened. There was not even a single trace from this scary event. But I was there, I saw it and I wouldn’t forget it. Unbelievable!